Properties in Rhineland-Palatinate average 4.6 out of 5 stars. Property 2: Forest cottage with sauna and fireplace in a romantic location, right on the river. Property 3: 2 Bedroom cottage home in quiet wine-country village on the Mosel. 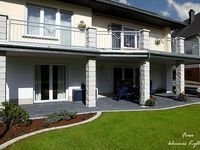 Property 10: 'Enoteka' - Quiet-modern apartment f 2 pers, Terrace / garden..
Property 23: Detached bungalow right on the edge of the forest in the Eifel mountains.